In his latest body of work, “Recinder”, Tasmanian born and Perth-based artist Nigel Hewitt utilises the medium of ash on canvas to construct landscapes in layered monochromatic tones, creating rainforest scenes that may be desaturated of colour but are saturated with meaning. Not only do his pieces prompt the viewer to think of a natural environment under threat, they also pose questions about Australia’s prevailing colonial attitudes and the ongoing conversation surrounding our ideas of land, heritage and identity. The use of ash in these pieces goes far beyond any traditional notion of charcoal-based visual art. For example, Eucalyptus Regnans is a stunning depiction of wood chips and bark created from ash and polymer on canvas. What is particularly impressive and unique to Hewitt’s work, however, is his use of techniques that have been refined over a six-year period. Several of the pieces, including Down on their Luck and the Woven section of Yield, depict rainforest imagery in digital, pixelated form, providing further contrast to the hyperreal imagery in the foreground. Hewitt explains that ash was applied pixel by pixel using special equipment. The effect is similar to that of embroidery on an enlarged scale, as if he has used yarn and needle to stitch a naturally occurring scene. 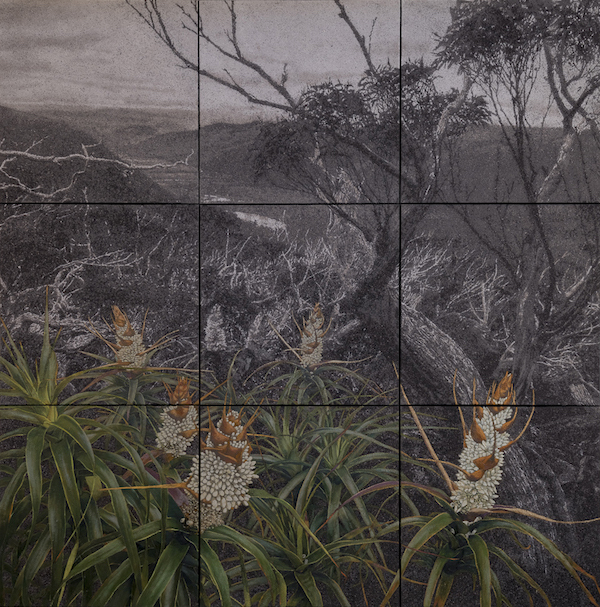 Hewitt uses contrasting images in the foreground to delve into issues such as the problems of colonial legacy or the tension between ecological loss and survival. In Cross-cutting and Arcadia, early twentieth century paintings sit on easels in the foreground, serving as a juxtaposition to the less romanticised Australian landscapes in the background. Easily a crowd favourite, Reformation vividly showcases the wildflower Richea Dracophylla in technicolour-like glory. “Reformation:, 2018, ash, polymer, oils on canvas, 187x187cm. Photo: Bewley Shaylor. Other pieces embody contrast in other ways, between light and dark, isolation and the whole. Trees and treescapes in this exhibition transfix the viewer. There is also a joy in discovering wildlife in the images. Hewitt has chosen to depict the thylacine (Tasmanian tiger), speaking to extinction and the ramification of human intervention. I was fortunate enough to meet briefly with Hewitt, who explained that using ash collected from bushfires across Tasmania carries a lot more meaning than the remnants of just any fire. Ash is a by-product of fire; it represents its finality and is an expression of its destructive forces. This, to Hewitt, makes it a fitting medium to use to explore concerns about the fragility of our natural surroundings. Add to this the confusion of histories, as depicted in In the Wake, where Indigenous peoples hold a flag symbolising Western “progress”, and we find vulnerability in our social and political constructs as well. A must-see exhibition, Hewitt takes monochrome to new levels, teaching us that not everything in life is black and white. “Recinder” is showing at Gallery Central at North Metropolitan TAFE until 19 May. Pictured top: “Down on their Luck”, 2017, ash, polymer, timber veneer on canvas, 183x225cm. Photo: Bewley Shaylor.